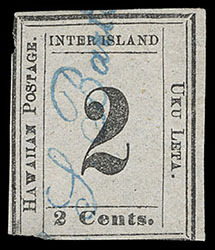 Hawaii, 1859, 2¢ light blue on bluish white, plate 3-A, type V, position 5, manuscript cancel, ample to large margins, small thins and light tropical stains, F.-V.F. appearance; with 1999 H.P.S. certificate. 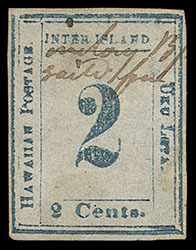 Hawaii, 1859, 2¢ light blue on bluish white, plate, large margins to just clear at top, cancelled by red "PAID" in arc handstamp, small thin spot, F.-V.F. appearance. 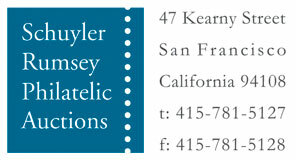 A VERY RARE EXAMPLE OF THIS "PAID" IN ARC CANCELLATION, THE FINEST OF ONLY TWO EXAMPLES WE HAVE RECORDED. There was another example of this rare red "Paid" in arc handstamp on the 2¢ light blue on bluish white 1859 issue (ex-Crocker, Atherton). Hawaii, 1859, 2¢ light blue on bluish white, plate 3-B, type VII, position 7, unusual small letters manuscript cancel, clear margins, small thin, Fine appearance; with 2017 P.S.A.G. certificate. 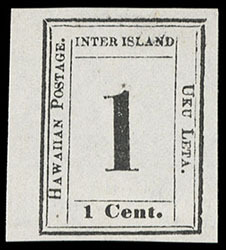 Hawaii, 1863, 1¢ black on grayish, plate 4-A, type V, position 5, without gum, full balanced margins, flaws including thins and a couple sealed tears, Very Fine appearance. 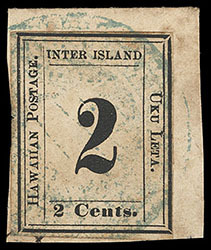 Hawaii, 1863, 2¢ black on grayish, plate 3-D, type VI, position 6, blue "C.S. Bartow" straight line (1RRR) handstamp, margins large to in at bottom and upper left, small flaws, a Very Fine strike, nice example of this extremely scarce Lahaina Postmaster Bartow handstamp, the listing example on Gregory's Post Office in Paradise website; with 2018 P.S.A.G. certificate. 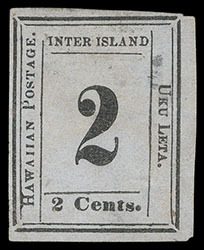 Hawaii, 1863, 2¢ black on grayish, plate 3-D, type I, position 3, tied on piece by blue negative "Custom House, Lahaina Maui" full rigged sailing ship seal used as a cancel (MH 303), clear to ample margins, thin and slight stains, Fine appearance; with 2005 H.P.S. certificate. 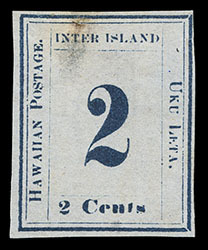 Hawaii, 1863, 2¢ dark blue on bluish, plate 5-B, type V, position 5, showing no period after "Cents", trace of o.g. at top slightly causing toning, clear to mostly ample margins, small thin and tiny tear at top, Very Fine appearance, one of the rarest Numeral issues in mint condition. AN ATTRACTIVE UNUSED EXAMPLE OF THE 1863 2¢ DARK BLUE ON BLUISH PAPER NUMERAL ISSUE. 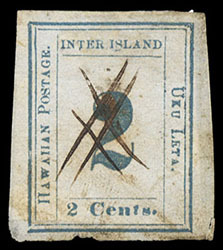 Hawaii, 1863, 2¢ dark blue on bluish, plate 5-B, type VII, position 7, raised "I" of "Inter" variety, manuscript "X" cancel, ample to mostly large margins, small faults, Very Fine appearance, a very rare variety. Scott No. 17 $8,750 for normal. 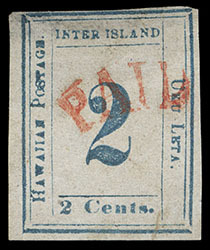 AN ATTRACTIVE APPEARING USED EXAMPLE OF THE 1863 2¢ DARK BLUE ON BLUISH NUMERAL ISSUE. 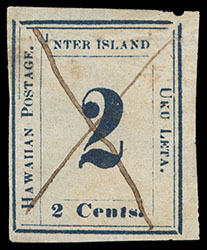 Hawaii, 1863, 2¢ black on blue gray, plate 5-A, type IX, Westerberg position 9, unused (traces of gum), large to full margins, small thin spots, Very Fine appearance, ex-Steiner. 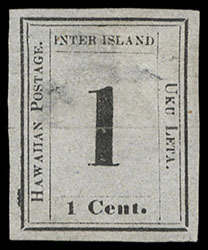 Hawaii, 1864, 1¢ black, stitch watermark, plate 5-A, type II, position 2, without gum, ample to huge margins, bright and fresh, Very Fine and choice.